Can you confirm these amateur observations of Gehyra nana? Type locality: King Edward River, "presumably 14° 52’ S, 126° 12’ E", W. A. Diagnosis Diagnosis. A Gehyra with small body size (mean 42 mm, range 34–55 mm SVL), no flap of skin between limbs, dorsal half of rostral deeply furrowed with groove, single internasal usually present, 2 postnasals of similar size, first supralabial taller and narrower than second, snout short and convex in lateral view, first digit of manus and pes without claw, mode of 6 (range 5–7) divided subdigital lamellae on fourth toe, mean of 15 (range 10–22) pre-cloacal pores in males arranged in a chevron pointing anteriorly. Background colouration dull light tan to brown with numerous small pale spots or short bars and large dark spots (not in contact) on dorsal surfaces that tend to form transverse rows on dorsum; no dark temporal streak behind eye (Doughty et a. 2018). Comparison with other species. 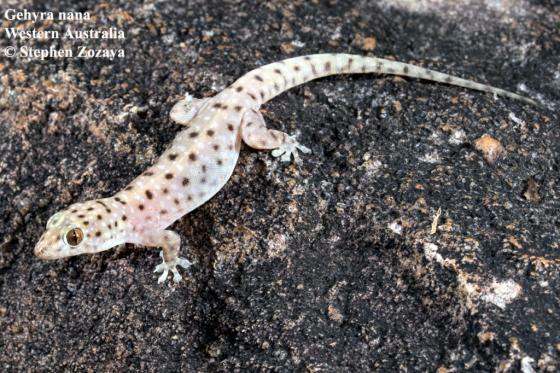 This species complex differs from non-Australian Gehyra by the absence of webbing between third and fourth toes, absence of a skin fold along the posterior hindlimb, and moderate adult size (typical SVL <50 mm). Additionally, members of the G. nana complex can be distinguished from the G. australis group (which are largely restricted to the AMT) by smaller size (max SVL <58 vs >65 mm) and divided subdigital lamellae (vs at least some undivided). The distributions of G. nana species do not overlap those of the arid zone members of the G. variegata group with a similar spotted pattern such as G. punctata, G. pilbara Mitchell and G. montium Storr. However, these arid zone species can generally be distinguished by possession of a rich reddish background colour in life (Hutchinson et al. 2014) whereas G. nana is more light brown to tan. An exception is G. moritzi Hutchinson, Sistrom, Donnellan & Hutchinson, which is phenotypically very similar to G. nana but occurs in the south-central Northern Territory 1000 km away. Arboreal arid zone species such as G. purpurascens Storr, G. variegata and G. lazelli Wells & Wellington tend to be light purplish-brown with networks of dark lines, rather than well-defined spots and blotches as in G. nana. Diagnostic loci are presented in Appendix 2, and can be used to compare sequences from tail tips or other tissues for confident identification with minimum sequencing. Gehyra nana can be distinguished from the G. variegata group species that also occur in the AMT as follows: from G. xenopus Storr, G. spheniscus Doughty, Palmer, Sistrom, Bauer & Donnellan and G. granulum sp. nov. by the absence of granules between proximal lamellae (vs present), and in the case of the former species, also much smaller size (max SVL 55 mm vs 79 mm); from G. occidentalis by fewer subdigital lamellae on the fourth toe (5–7 vs 7–10) and smaller body size (max SVL 58 mm vs 76 mm); from G. multiporosa by the absence of dark lateral head streaks (vs present), and fewer pre-cloacal pores in adult males (10–22 vs 15–54). Gehyra nana can be distinguished from the southern Kimberley species, G. girloorloo, by a combination of dorsal colouration in life (background colour pale to dark tan vs pinkish-grey; diffuse vs clear markings), robust body (vs gracile) and tail tapering from base to tip (vs thin tail); from G. pseudopunctata sp. nov. by smaller body size (34–55 vs 47–58), more numerous pre-cloacal pores (10–22 vs 7–11), fewer subdigital lamellae on the fourth toe (5–7 vs 7 or 8) and smaller pale and dark spots on the dorsum; and from the southern Kimberley, Great Sand Desert and northern Pilbara species G. kimberleyi, by a moderately flattened head (HD/HL 0.29–0.54) vs. deep head (HD/HL 0.40– 0.58) and small body size (34–55 mm vs 37–61 mm SVL for G. kimberleyi). The restricted distribution of the small-bodied G. pluraporosa sp. nov. overlaps that of G. nana (lineage nana4) in the northern Kimberley (Fig. 1). However, G. pluraporosa sp. nov. possesses numerous pre-cloacal pores in males (25–26 vs 10–22), the upper postnasal is larger than lower postnasal (vs similar in size in G. nana other species) and has a dorsal pattern with alternating poorly-defined pale and dark blotches or bars, overlain with pale stippling (vs relatively well-defined pale and dark spots not in contact on plain reddish-brown background in G. nana). Gehyra nana most closely resembles G. paranana sp. nov., but differs in usually having 5 or 6 subdigital lamellae on the fourth toe whereas the latter usually has 7. In addition, the pale spots in G. nana tend to be smaller than the dark spots, whereas in G. paranana sp. nov. they are approximately equal in size, and the spots on G. nana also tend to be clearer than those of G. paranana sp. nov. (cf. Fig. 5, 7 vs 9 in Doughty et al. 2018). Comment Belongs to the Gehyra variegata-punctata species complex, or more specifically to the G. nana complex that has a number of undescribed species (Moritz et al. 2017). Habitat. This species has been collected from sandstone and other rock formations in open woodlands. Occurs under large flat rocks on open sandstone platforms as well as rocky creeks and gorges, including scree. Occasionally found on trees, but always near rocky outcrops. 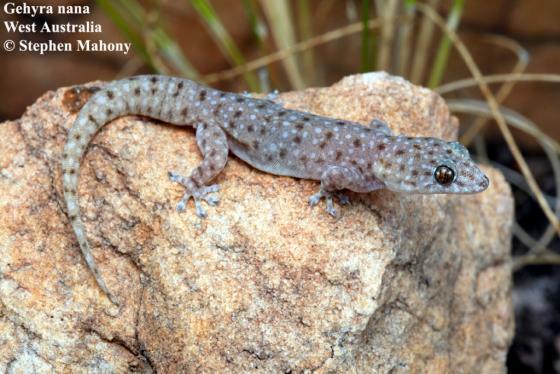 It is generally found among small boulders and loose rock rubble, but can occur on larger open rock faces in the absence of larger Gehyra species such as G. koira Horner or G. pseudopunctata sp. nov.
Etymology Storr used the word nana (Latin), meaning small, to describe this small-bodied species relative to larger forms of Gehyra.